There are 4 living species of three- fingered sloth, all of which live within the forests of Central and South America where the tropical climate maintains relatively warm temperatures all year round. All four species have small round heads with small ears, a characteristic dark mask around the eyes and a permanent, enigmatic smile. They have short, stubby tails (6-7 cm) which they use when defecating, and three elongated fingers at the end of each limb. Although virtually all mammals possess 7 cervical (neck) vertebrae as standard, sloths are one of the few mammals to break this rule. Two-fingered sloths and manatee’s retain only 5, while three-fingered sloths have 9. This unusual adaptation gives three-fingered sloths the ability to turn their head through 270° which allows them to effectively scan for predators without having to move their whole body (saves energy) and to see the world the right way up, despite hanging upside down! Although they spend most of their time in the trees, sloths are surprisingly good swimmers – they can swim through water three times faster than they can move on the ground! Their long neck helps them to effortlessly keep their heads above water when swimming. Sloths have also been observed descending to rivers to drink and defecate. Sloths are famous for their unusual and bizarre bathroom habits – they will only relieve themselves once a week and they will only do it on the ground. Sloths have been known to lose up to a third of their body weight in one sitting! This weird weekly routine remains one of the biggest mysteries surrounding sloth behaviour and one that scientists have struggled to explain for decades. The likely explanation is that it’s all about communication and reproduction. Muscle tissue is metabolically expensive to maintain, and in order to save energy, sloths have just 30% of the muscle mass expected for a mammal of similar size. Despite this apparent deficiency, three-fingered sloths are considered to have immense strength and power capabilities with a high resistance to fatigue due to an unusual and highly efficient muscle arrangement. In addition, three-fingered sloths have been found to possess unique fibrinous adhesions which bind the abdominal organs against the ribs. These adhesions allow sloths to hang completely inverted in the canopy without the weight of the abdominal contents weighing down on the lungs. Maintaining a stable core temperature is energetically very expensive, and sloths appear to have almost completely sacrificed this ability. Similar to many poikilotherms, they rely on behavioural methods of thermoregulation (basking etc.) and can exhibit daily fluctuations in core temperature of up to 10°C. This fluctuation is in stark contrast to most endothermic mammals, which are able to maintain a constant core temperature of approximately 36°C regardless of the ambient temperature. Three-fingered sloths hair is specially adapted to facilitate the growth of symbiotic algae and fungi. Each hair has a unique groove running along the length of the shaft which traps moisture. The algae and fungi that grow make the sloth appear green which facilitates camouflage in the rainforest canopy. Some species of fungi living in sloth fur have even been found to be active against certain strains of bacteria, cancer and parasites! Alongside hosting algae and fungi, sloth hair also provides home to an entire ecosystem of invertebrates – some species of which are found nowhere else on earth! A single sloth can host up to 950 moths and beetles within its fur. These colonies of invertebrates don’t appear to bother the sloth: they merely lay their eggs in sloth faeces and feed on the algae and fungi found within the hair. All three-fingered sloths are strict folivores – meaning that they only eat leaves. 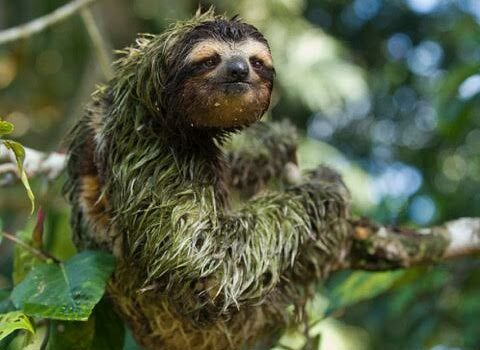 Sloths in the Bradypus genus are known to feed from over 90 tree species as a whole, but each individual will often only consume 7-12 different trees, favouring the younger, greener leaves due to their lower toxin content. 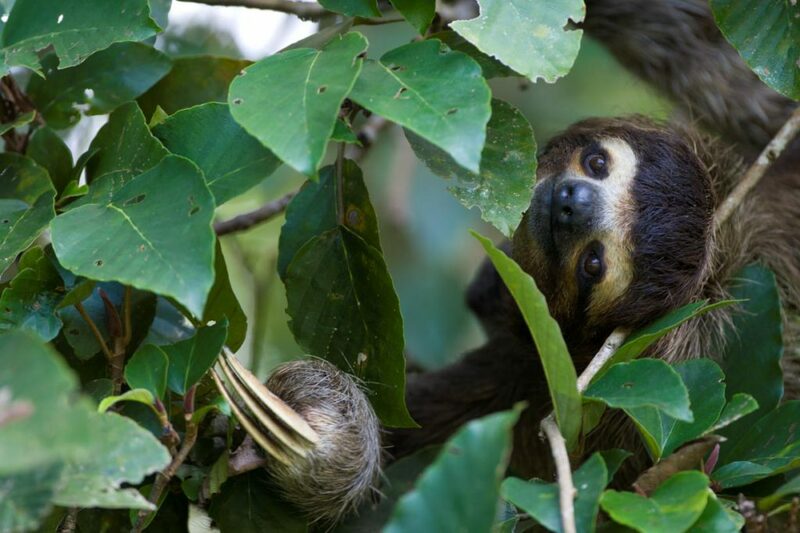 There is evidence to suggest that individual sloths selectively rotate the tree species that they feed from in a cycle which alternates the types of toxins present in the leaves. This routine is learnt and passed down from mother to baby. Sloths possess large, slow-acting four-chambered stomachs that contain symbiotic bacteria to aid digestion. 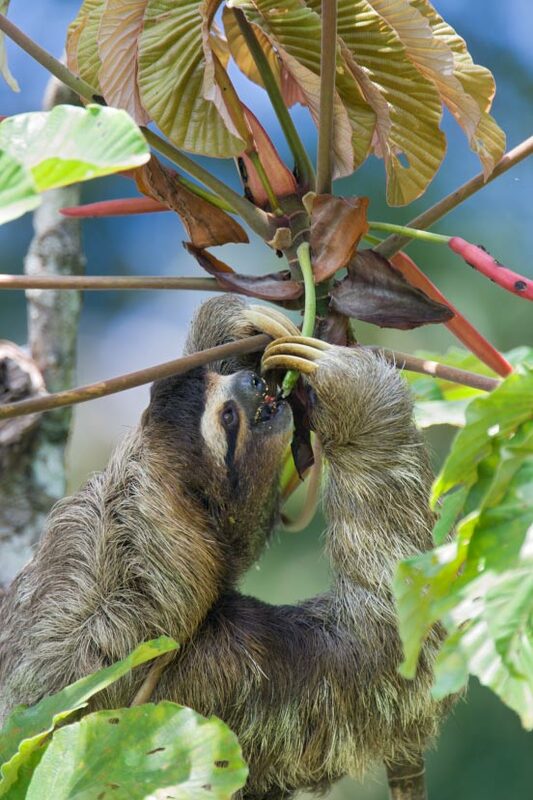 Having one of the lowest metabolic rates of any non-hibernating mammal, it can take up to 30 days for a three-fingered sloth to digest one leaf. As a result, sloths are thought to have a constantly full stomach which can account for up to two-thirds of their body weight. Although the exact oestrus cycle is unknown, it is thought that three-fingered sloths go in to heat for 7-10 days every month. During this time the female will emit a high pitched vocalisation to signal her readiness to mate. There is some debate as to the presence of a mating season in three-fingered sloths, although this appears to be limited to regions which experience extreme seasonal change. Male sloths are strongly polygamous and will fight to exclude competing males from their territory. 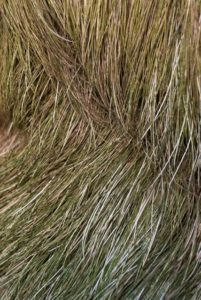 At sexual maturity (12-24 months), male sloths develop a speculum: a distinctive and brightly coloured patch of fur located on the upper back. Although the purpose of the speculum remains unclear, it is thought to be important for sexual selection. Females give birth (hanging upside down) to a single young after a gestation period estimated to be between 6-12 months. The baby is born ready to face the world, with fully formed teeth, eyes open and a strong instinct to cling onto the mother’s fur. They do sometimes fall, but sloths are incredibly resilient and have been known to survive a drop of over 90 feet! A baby sloth is thought to stay with the mother for a full 12 months, during which time it learns all of the essential skills required to survive in the wild. As well as drinking milk, the baby will begin to sample leaves from around the mother’s mouth from as early as 1 week old. This process teaches the offspring exactly which tree species are safe to eat. Following the weaning process, the mother leaves her territory to her young and establishes herself elsewhere. The sloths survival strategy is camouflage, and as a result they do not have many ways to protect themselves. Their natural predators are big cats, snakes and Harpy eagles, although few of these remain in the wild today. The biggest problem threatening the future of wild sloth populations is the rapidly expanding human population. Every day hundreds of sloths are falling victim to the land development, urbanization, and habitat destruction occurring in South and Central America. From power line electrocutions and dog attacks, to road collisions, habitat loss and human cruelty, it is a long and sad list. The brown-throated sloth is probably the most well known of all of sloth species due to its wide distribution. They can weigh between 2.3 and 6.5kg and are approximately 40-69cm in length – from nose to tail. They have grey/brown colouring with a white forehead. 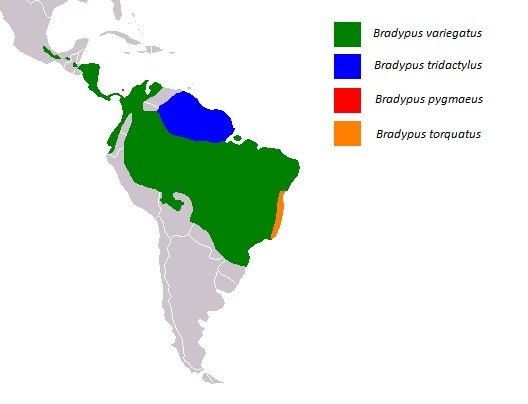 Distribution ranges from Honduras all the way down to Peru and Bolivia, co-existing in some areas with the Hoffmann’s two-fingered sloth (choloepus hoffmani). The life expectancy is currently unknown due to the difficulties of keeping bradypus sloths in captivity, but it is estimated to be 30+ years. The oldest brown-throated sloth in captivity is currently over 25 years old. They are often confused with the pale-throated sloth (bradypus tridactylus). Pale-throated sloths live in the rainforests of northern South America, ranging from French Guiana to Suriname and Colombia. They are of similar size and weight to the brown-throated sloth; however they have a pale yellow patch of fur on their throats. Like other three-fingered sloths they have just five teeth on their upper jaw and four on their lower jaw which are small and rounded. The maned sloth is only found in the Atlantic coastal forest of Brazil. Maned-sloths are pale brown to grey and are so named due to the presence of a distinctive mane of black hair on the neck. The mane is usually larger and darker in males, perhaps because they do not develop the speculum as seen in other species of three-fingered sloths. They can grow up to 75 cm in length and nearly 10 kg in weight – making them the largest species within the bradypus genus. Females tend to be slightly larger than males. Maned-sloths have a home range of up to 14.8 acres which is thought to be larger than other bradypus species. The biggest threat to the maned-sloth is habitat loss due to lumber extraction, plantation clearance, agriculture and charcoal production. There is also some evidence to show poaching for both food and the pet trade. Pygmy sloths are found exclusively on the tiny and remote Isla Escudo de Veraguas in Panama and were only identified as a new species in 2001. They are thought to be approximately 40% smaller than their mainland counterparts and although the population size remains unknown, these little sloths are considered to be one of the most critically endangered mammals in the world. They average around 3 Kg in weight and are approximately 24 inches long, looking very similar to the brown-throated sloth. Pygmy sloths are thought to live in and feed primarily from the red mangroves which surround the island, but have also been known to inhabit the exterior of the interior forest.